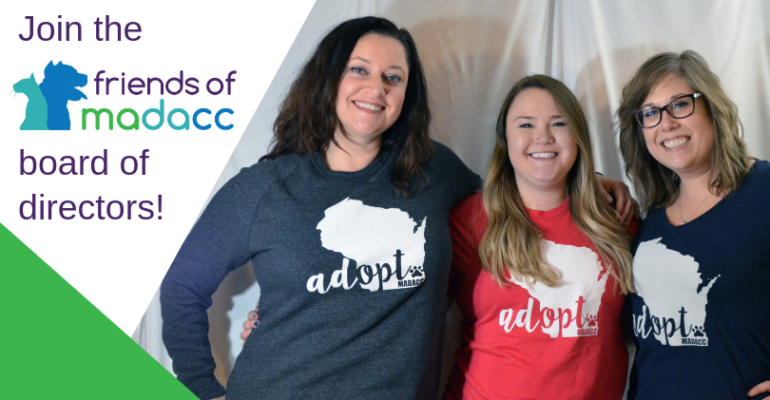 Friends of MADACC (Milwaukee Area Domestic Animal Control Commission) is a 501(c)(3) non-profit organization dedicated to promoting community awareness and improving the welfare of nearly 10,000 homeless and neglected animals MADACC cares for every year. Friends of MADACC is managed by a volunteer board of directors and with the help of volunteers provides wellness programs that focus on helping low income families keep their pets healthy; education programs that focus on educating the youth on the importance of treating their pet as a family member and resisting pressure to engage in acts of cruelty; and raises funds for the animals that come through MADACC. We also offer spay and neuter programs to help reduce the pet overpopulation in Milwaukee County. Friends of MADACC is seeking a reliable volunteer who is passionate about helping animals and who can assist the Treasurer with bookkeeping, sending tax receipts, and various other tasks to maintain our compliance with state and federal laws as well as generally accepted accounting principles. Ready to make a difference? Please send your resume and a letter of interest to Alison (amtweddell@gmail.com) and Kelly (kellyoylerfom@gmail.com). Note: this is an unpaid position. Friends of MADACC is searching for a jack-of-all-trades volunteer Marketing Co-Chair to help develop marketing plans, launch communications across a variety of channels, and raise awareness of our organization’s and MADACC’s work! Ready to make a difference? Please send your resume and a letter of interest to Cassidy (cdavisfom@gmail.com) and Kelly (kellyoylerfom@gmail.com). Note: this is an unpaid position. Ready to make a difference? Please send your resume and a letter of interest to Kelly (kellyoylerfom@gmail.com). Note: this is an unpaid position. Ready to make a difference? Please send your resume and a letter of interest to Kelsey (burazk11@gmail.com) and Kelly (kellyoylerfom@gmail.com). Note: this is an unpaid position.